Review the tip sheets What Employers Need to Know and/or What Supervisors Need to Know to understand the components of a winter driving program. Review Winter Driving Hazards to help you identify risk factors related to your drivers, vehicles, trips, weather, and road conditions. Assess the risk of each, determine where measures are needed to eliminate or minimize risk, and prioritize action items. Develop or review your winter driving policy. (Note: A winter driving policy can be part of a road safety policy or your health and safety program policy.) Make sure it covers all workers who drive while at work, even occasional drivers and those driving their own vehicles. Review this sample policy. 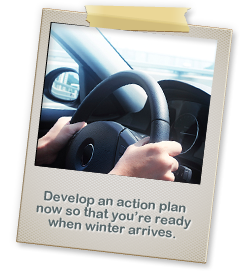 Your policy can be detailed, or simply a short statement about your aims and expectations for winter driving. 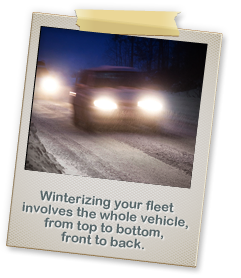 Develop or review your winter driving safe work procedure. See sample procedure, modifying as needed for your workplace. This procedure instructs your workers on what to do to keep safe when driving in winter conditions. Develop a tracking system to record winter-related driving incidents (or review last winter’s). Include type of incident (e.g., single or multi vehicle, slid off road, got stuck), weather conditions, location, time of day and probable cause. This will help you analyze and manage risks for next winter. Include close-call reporting (e.g., slid into intersection, skidded, got temporarily stuck) as part of your tracking system. Many workplaces may have few incidents to learn from, but may have plenty of close calls. An anonymous reporting system may encourage workers to consistently report. Familiarize yourself with the contents on this website. This will give you a head start when winter arrives. When winter conditions are nearer, review During Winter to put your plan into action. See the Annual Planning Calendar for a quick overview of yearly action items. Review the types of trips your workers are required to take. Who, where, for what purpose? Review Winter Driving Hazards for detailed road and weather hazards. This will help you identify trips that require additional attention. Look into how you can reduce road travel. What can you do now to limit trips once winter arrives? Can work be conducted by email, phone, video conferencing, online meetings? Is public transport an option? 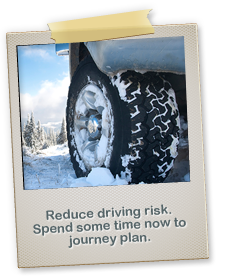 For trips that can’t be postponed, identify alternative schedules and routes to minimize winter driving hazards. Bookmark DriveBC to quickly access to weather and road conditions when winter arrives. Confirm that your fleet vehicles have 4 matching winter tires. Schedule installation. Winterize your fleet vehicles. Make sure tires, battery, brakes, cooling and heating systems, electrical and exhaust systems and belts and hoses are in good working order. Switch to winter wiper blades. If you have workers who drive their personal vehicles for work, instruct them to install winter tires and winterize their vehicles. Distribute Preparing your Vehicle capsule tip and Winter Tire capsule tip. Equip each fleet vehicle with a winter survival kit. See the Winter Driving Survival Checklist. Consider providing kits for workers who use their own vehicles for work purposes. This is especially important for journeys on rural or isolated roads. Identify emergency arrangements should workers get in a crash, have a breakdown, or get stuck. Make sure workers understand your organization’s working alone procedures if they’re driving in areas where assistance, if required, would not be readily available. If tire chains are to be used, ensure each vehicle has a pair and drivers know how to install them. Instruct workers to chain up in a safe location – away from busy roads. Instruct your workers to prepare for winter conditions. As winter approaches, distribute the Think You Know All About Winter? capsule tip. Most winter-related driving incidents are caused by driver error. All workers need to know winter driving hazards and what to do to eliminate or minimize risks. Schedule distribution of What Workers Need to Know tip sheet as winter nears. Schedule regular distribution of capsule tips – every Monday morning throughout winter, for example. Schedule tailgate meeting guide and the powerpoint presentation. Be prepared to communicate as weather conditions dictate. 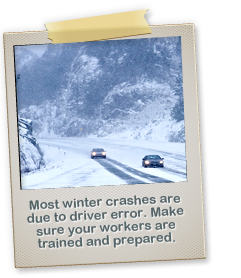 Review Winter Driving Hazards to help you address the hazards your workers may face. Ensure your workers have the driving skills to drive in winter conditions. For those who don’t, schedule training on winter driving. Confirm that all workers who drive have cell phones or two-way radios in case of emergency.